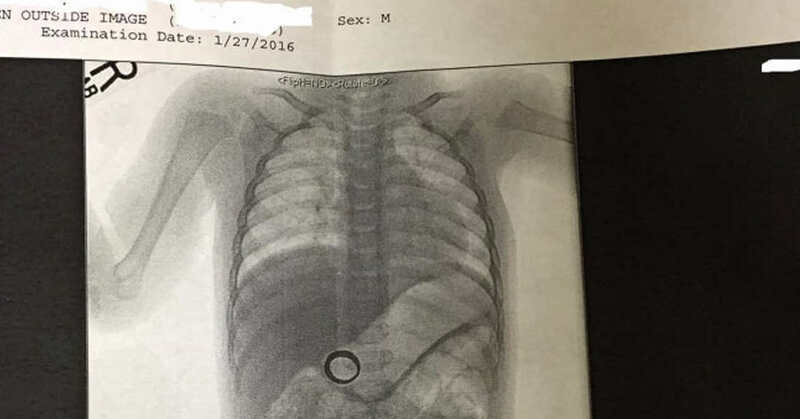 "My wife couldn't find her wedding ring yesterday," a Seattle father explained "We decided to have our baby x-rayed just in case." An accompanying x-ray indeed showed a ring inside a very wee tot. The 14-month-old boy is fine after eight hours under observation at a children’s hospital, the dad assured. A GI doctor said the best tact was for the parents to simply wait for the bauble to re-emerge naturally. "Ah, it's ok. He's a pretty funny little dude," posted the dad, "S--t happens. Hopefully soon, with diamonds." The baby likely swiped the ring from the bathroom counter Wednesday morning, the dad wrote.